Poker Copilot 4 is under development. Buy version 3 now and receive a free upgrade to version 4 when it is released. Poker Copilot 4 has a new “Tournaments by Date” summary. To avoid confusion, the existing “Tournaments” summary is renamed “Recent Tournaments”. All the Poker Copilot conventions are present: ordering by any column, a summary row, right-click on the screenshot to save or print, zoom-in and zoom-out. Notice in the top-left hand corner that you can select any column to show in the chart. 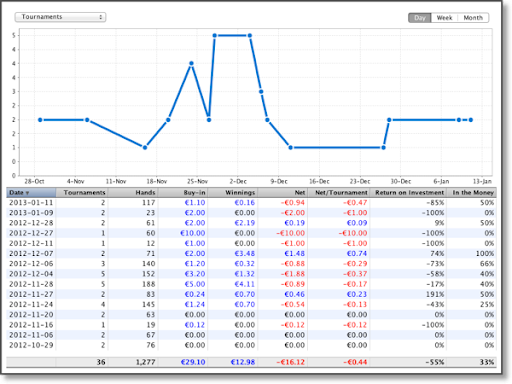 On the top-right hand corner you can turn both the chart and table into a “by-week” or “by-month” chart. You’ll be able to try this out in the next PCP Dallas EAP update.